© 2009 by Jonathan Jarrett. All rights reserved. This edition copyright © 2009 by The Heroic Age. All rights reserved. Abstract: Medieval studies is always greedy for more evidence, yet numismatics, which can be seen to sit uncomfortably between archaeology, art history and amateur collecting, is rarely given the importance it deserves. This article explains what it is that those who pay no attention to medieval coins may be missing, and sets this in the context of the theme of the series by explaining the writer's present employment at the Fitzwilliam Museum with an introduction to its collections of coins and the process of making them available to all on the world-wide web. §1. Scholars of the early Middle Ages must be grateful for any evidence that comes to hand, and so it will hardly be necessary to explain to the readers of The Heroic Age that coins, when they can be found, are a useful source. All the same, the use of coins as historical evidence is less self-evident than it might appear, and requires some caution in its interpretation (Grierson 1975, relied on throughout; also for medievalists Grierson 1976, Coupland 2005, 211–2). This article aims to make clear the potential and problems of numismatic evidence to the reader, before explaining some of the work on which the writer is currently engaged to increase the availability of such evidence to the enquirer on the world-wide web. §2. The complexity of coins as evidence derives form the fact that they have a dual nature: they are documents, usually bearing text and issued in the name of a known author, but they are also archaeological objects, deposited or lost in the soil or else hoarded or collected long after their originally intended use. A coin is usually issued for immediate use; it is therefore a contemporary source, and its survival to us means that it is out of context in a way that, for example, a monastic foundation narrative, aimed as much at future generations as its contemporaries, may not be. The other complication, and the great potential, of coins as evidence, is the number in which they survive. There are, for example, one hundred and seventeen charters of King Æthelred the Unready known to historians, which makes him unusually favoured among Anglo-Saxon monarchs; but his coins survive in tens of thousands and the simple work of counting them has not yet been possible. As of February 23, 2009, a search for Æthelred II's coins in the Fitzwilliam Museum, Cambridge's Early Medieval Corpus and Sylloge of Coins of the British Isles database produced 7,080 results. This is some kind of illustration, but even in 1881 a catalogue of the holdings of the Coin Cabinet of the Royal Museum in Stockholm numbered a further 4,300 Anglo-Saxon coins, largely of this reign (Hildebrand 1881) and the Cabinet has three entire volumes planned to record its holdings from the reign, which is as much to say that that number might, when they eventually emerge, be closer to thirty or forty thousand. There is also every prospect that more will yet be found, possibly in large numbers, whereas new charters are extremely rare and would be warmly welcomed. The questions of use and interpretation of a coinage are thus of a wholly different order than for most of its comparanda. §3. 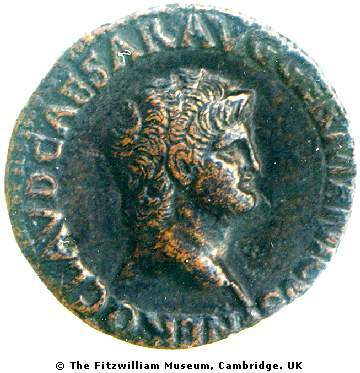 Coins are however often of great use in assisting with the interpretation of other evidence, not least because they are often closely datable, with consequent implications for the archaeological layer in which they are found. Even if this date is not given on the coin, numismatists are often able to give the date of a coin's production within a narrow range. This is not perfectly simple, however. 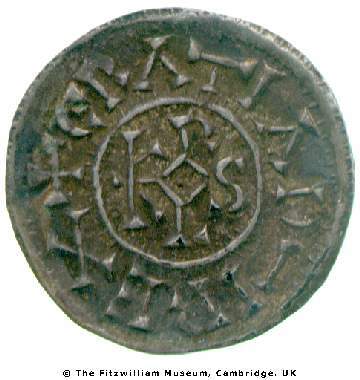 Quite apart from purely archaeological concerns—such as whether the coin was truly lost where it was found, or has been transported in fill from another part of the site—coins do not always tell the truth.1 The coinages of Charlemagne (768–814) and Charles the Bald (840–77) both bore a monogram of the royal name Karolus, which has become famous because Charlemagne also used this to sign his charters (Garipzanov 2006; see also Coupland 2005). This monogram came to represent authority so completely that the feudal lords of the tenth and eleventh centuries adopted it for their own coins, even when their names were nothing of the kind (examples Roberts 1996, 242–3). 2. Reverse of silver denier of Déols struck from Count Odo the Old (1012–1037), PG.2252, Grierson Collection, copyright Fitzwilliam Museum, Cambridge. 3. 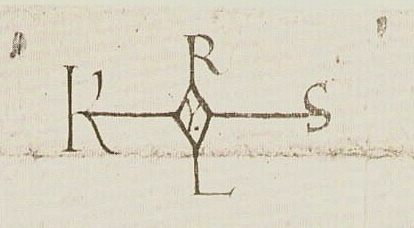 Monogram of Charles the Simple from a precept to the nunnery of Sant Joan de les Abadesses, Ripollès, Catalunya, June 4, 899, reproduced from Lauer 1920, copyright expired; for newer refs. to the document, see Udina Martorell 1951 no. 11. §4. Such 'immobilised' issues can considerably confuse attribution. 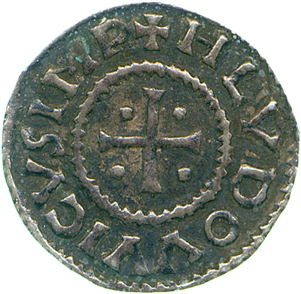 Frequently, moreover, new coinages of the Middle Ages were begun by more or less faithful imitation of foreign ones; in Scandinavia this imitation extended to the use of not just English coin types, but in the late tenth century of actual dies from which English coins had been struck, and in Scandinavia there is therefore a real possibility of a coin find being of either ancestry (Blackburn 1985; Malmer 1997). And, except in areas where control of the coinage was close, coins could often, once in circulation, remain there for many years; some Roman coins seem to have remained in circulation literally for centuries, becoming slowly more worn but still being passed from hand to hand in exchange. 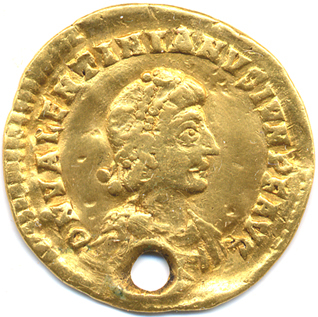 As ornaments, often pierced so as to be hung around the neck, Roman coins are known from determinedly Anglo-Saxon contexts, and one type of King Edward the Confessor (1042–66) imitates a sixth-century Byzantine issue so closely that it is ineluctable that an actual specimen of the coinage was before the die-cutter (Metcalf 1982, 205). 4. 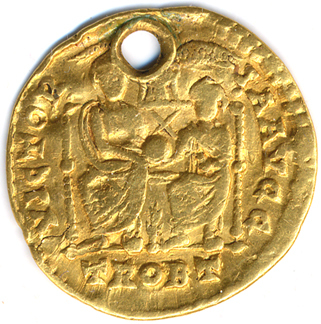 Obverse and reverse of gold solidus of Emperor Valentian (378–392), found in an Anglo-Saxon grave of the sixth century at Droxford, Hampshire; EMC 2004.0103; now owned by Rory Naismith; image copyright Rory Naismith, reproduced with permission. §5. The precise interpretation of a coin find depends a very great deal on its context (Blackburn 2003 & pers. comm.) The subtlety lies in the intent of the original owner in depositing the coins. While a single find is likely a casual loss, a hoard may be expected to contain items of high value; there is little point in secreting small change if one have big money and be in fear of losing it. This makes a hoard some kind of evidence for wealth, but less so for the currency at large, whereas a single find is likely to represent what people were actually carrying around and what might therefore be lost, but is less likely to contain high value items, simply because the owners would take better care of them. 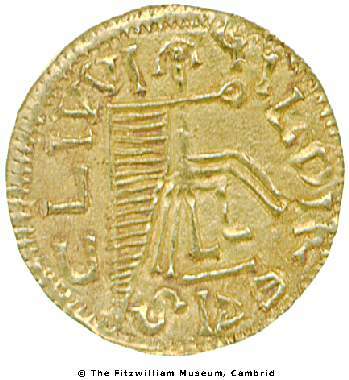 A Visigothic gold tremissis, for example, had such high buying power that the loss of a single one would have been a small catastrophe except for the richest persons. As a consequence, it has been suggested that the coins were in fact not intended for market use, where they would have been almost impossible to change unless buying in serious bulk, but for hoarding by the nobility, a deliberate form for treasure in the same line as counter-marked ingots or modern Krugerrands but with the propaganda advantages of bearing the royal imitation of Imperial dignity (Salrach 1998). On the other hand, in England where metal detecting is permitted, pale-gold tremisses of Francia and the early English kingdoms, of not dissimilar value, are found not uncommonly on sites that we know to have been commercial centres (Blackburn 2007). It may therefore be that Spanish interpretations have been made from silence, but on the other hand in Spain lower denominations of coin were also in circulation, so the pattern of coin use will have been rather different (Grierson and Blackburn 1986, 46–54). The matter remains controversial. When the usual concerns about an object from an archaeological context are added to these specialist ones, it may be understood that coins can be problematic finds. 5. Gold tremissis of uncertain mint in name of King Leovigild of the Visigoths (572–86), PG.10962, Grierson Collection, copyright the Fitzwilliam Museum, Cambridge. §6. All the same, because a coin is a unit of wealth, the fact of its find suggests that the site in which it is found generated value of a sort that could be exchanged for this form of wealth storage. In short, money on a site means that there was money to spare, for someone, even if not much. The money itself thus becomes evidence for value and wealth, and this sort of implication scales up: a period from which many finds of good-quality coinage are known was clearly a period in which much wealth could be captured in metal and circulated, whereas bad coinage and local circulation would tend to show the reverse. A coinage can thus by its status, circulation and quality indicate the overall health of a trading economy, although in some medieval economies trade was likely less important and coinage's function primarily ceremonial or ornamental. §8. It is also possible, with determined study, to make remarks about the economy based on the volume of a coinage. There are obvious problems with this in that we do not, naturally, ever have all of a coinage preserved, and survival and discovery rates differ radically from place to place. In Scandinavia we have so very many foreign coins of the Anglo-Saxon era because the states there were not, as England was, reminting incoming foreign coin; in Spain and some other countries metal-detecting is illegal, meaning that coin finds are rare even where we know that coin use was substantial (as in, e.g., Jarrett forthcoming). Arguments from simple quantity thus rest mainly on silence, and a single large hoard might radically change the picture of many early medieval currencies. More subtle means of analysis are however possible, because of the methods of a medieval coin's manufacture. (Grierson 1975, 94–111, is the basis of what follows and has illustrations and further detail). §9. Medieval coins were made by hammering blanks, either lumps cut off a rod of metal or sections of a larger sheet that were cut up later, between two dies. Both dies bore incuse designs that would be reflected in relief on the coin's surfaces; the lower was fixed into an anvil, and the upper placed over the sheet and hit, hard, with a hammer by the workman. Several impacts might be necessary and some coins that shifted between strikes show the design slightly staggered from the distinct blows. The coin would then have its edges smoothed and be passed into circulation. 6. 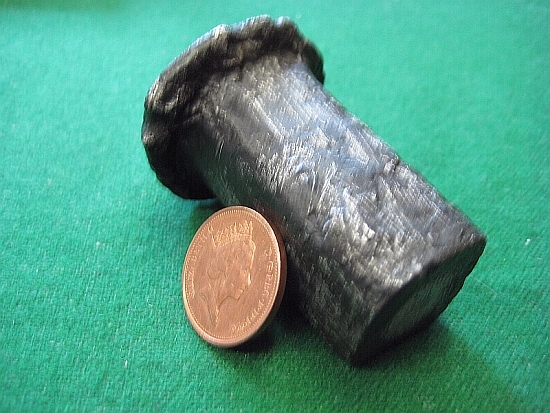 A reproduction of an Anglo-Saxon upper coin die owned by the Fitzwilliam Museum; photograph by Rory Naismith and used with permission. §11 Attempts have been made to take such quantification beyond the merely relative. In the case of the older hypothetical work still often used by historians, this can be distinctly unsafe. Such attempts rely on an initial estimate of how many coins a die might be expected to produce; then, by statistical mathematics, it is possible to extrapolate from the number of dies known and the number of available coins that they produced to a total that may reflect the actual number of coins produced (Grierson 1975, 94–111; Smith 1995). If this could be relied upon, it would obviously have considerable implications: for example, when the Anglo-Saxon Chronicle reports that England was called on to pay 30,000 pounds of silver by way of Danegeld in 1007 (Swanton 1996, s a 1007), was this well within the reach of the coinage, or did it represent a substantial inroad into the money of the realm? Can we even rely on such figures in written sources, or does the volume of coinage bely them? Much work has gone into such estimates and disputing them (eg. Sawyer 1965; Metcalf 1965; Lawson 1984; Metcalf 1989; Gillingham 1989; Lawson 1989; Gillingham 1990; Lawson 1990; Metcalf 1990), but they are fundamentally based on anachronism, because the only figures we have for production per die relate to later periods, when the monetisation of the economy was much more pronounced and economic circumstances very different. In fourteenth-century Brussels a coin die would be worked until it broke, and might produce as many as fifty thousand coins; elsewhere and elsewhen a die might be considered expired after it had struck three thousand times. But there is no guarantee that dies used for early medieval coinages were even used to capacity, either because of replacements of the design or simply because demand did not require it, and therefore such estimates for coinages of this journal's period have to be treated with the utmost scepticism, however possible they may be in later periods (again, Grierson 1975, 94–111). §12. Against this naysaying, it must be admitted that newer methods, using sophisticated techniques of statistical analysis, may permit closer guesses to be made. 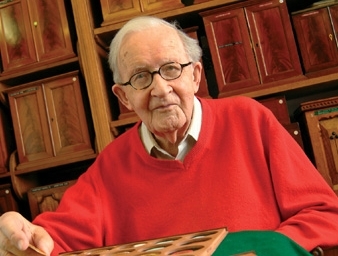 Warren Esty in particular has dedicated attention to the application of such methods to the size of ancient currencies, using computer-generated 'virtual hoards' to test the accuracy of various mathematical estimators. As well as choosing the best ones in his article by such testing, he finds that it is more accurate to reason first to the coverage of a sample, that is, how many dies were probably involved as deduced from the number that survives, and then work from this figure to the issue size, than simply to go there direct, as errors induced by the two steps tend to cancel each other out. All the same, though his work shows clearly the methods that should be used by numismatists intent on pursuing such analyses, he himself has repeatedly to offer cautions like: "note that if even a few die-identities are overlooked, or if the sample is pre-selected for varieties, the estimates are strongly influenced. These results, valid for random samples, must be used with caution." Since, in real conditions, as Esty also observes, the sample is never exactly random, even if it can sometimes be close-to-random (and this can to an extent be tested), even Esty's best methods contain substantial room for error which could, if multiplied up to a whole coinage, be wildly misleading. His contribution is to greatly minimise the error margins compared to other methods of estimation which, nonetheless, continue in use. A historian wishing to take advantage of such figures should therefore be very cautious about the methods with which they were derived (Esty 1986, quote 210, see also esp. 198–9, 203, 210, 213 & 214 for reservations). In any case, figures obtained by such methods do not give the final step required by the economist, that of the currency; they give only totals for one type of coinage, and the questions therefore remain open what other coins, older or newer, remained in circulation, how much coin stayed in the country of issue and how much was put aside as treasure, and many more possibilities. Only then, as is possible with the English coinage in the reign of Henry I, when we have documentation of the amount struck to cover a deliberate recoinage of the whole currency, do we come close to being able to answer such questions (Allen 2006). The twelfth century may however tell us little about coin use in earlier centuries. §13. Coins also function as evidence at a much more personal level. It has been said that a coin is like a metal charter, in as much as it is a portable written source usually issued by some kind of authority (Garipzanov 2006, 424). All the same, such a statement misses the point of the charter at the expense of that of the coin; the key difference is that while a charter affirms the rights of another party, the coin is a statement about the issuer (cf. Grierson 1975, 2–5; for the definition of charters see Jarrett 2005, 27). This means that a coin can be studied as a key to the political aims of its issuer. It can even tell us more about them: for example, until the early fourth century Roman coins bear apparently naturalistic portraits of the issuing emperor. This allows us, for example, not only to know what Emperor Nero was considered to look like, but also to follow the decline of his reign in his own increasingly dissipated appearance, from a slightly pugilistic-looking teenager to a many-chinned and piggy-eyed picture of over-indulgence. 7. 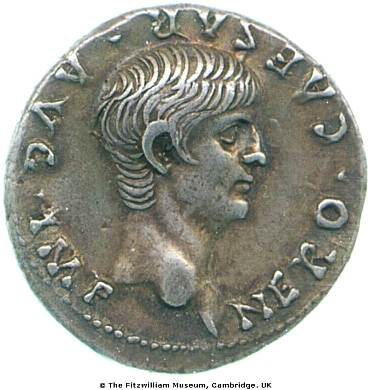 Coins of Emperor Nero: a silver denarius of Rome, 55 A. D., from the Young Collection, CM.YG.1216-R; a bronze as of Lugdunum, between 64 and 66, CM.RI.194-R; an oricalchum sestertius of Lugdunum, between 64 and 66, from the Christ's College Loan, CM.CH.8-R; all images copyright Fitzwilliam Museum, Cambridge. Not to scale! §14. 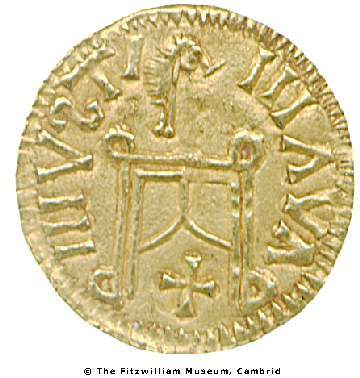 Medieval coinages did not have portraiture so naturalistic as the money of the Empire, but there is an obvious political message involved in the numerous depictions of early medieval rulers wearing the diadem associated with the Byzantine Emperors, or more generally in the imitation of Imperial coin types. 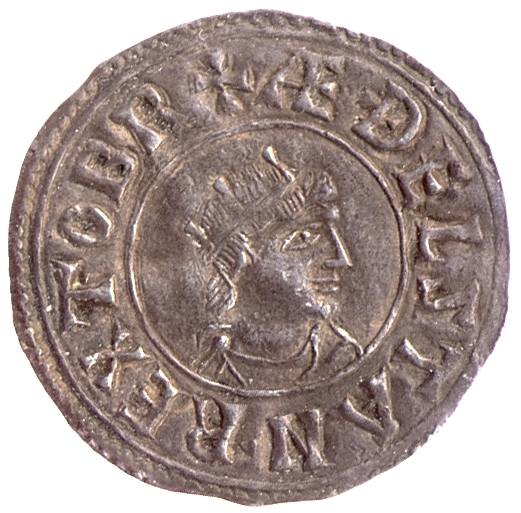 Likewise, when the Carolingian Emperor Louis the Pious (814–40) began to issue coins that bore his name on one face and a Temple on the other, the association of his person with not just the practice of religion, but an authoritative source of religion, reflected the emperor's policies of religious uniformity. In order to make the point still more firmly, the coins also bore the legend XPISTIANA RELIGIO, 'the Christian religion'; these coins of Louis claimed him the authority of a theocratic ruler by this association of his ruling name and titles with that of the state cult, and the type was much repeated by later rulers (Coupland 2002; Coupland 1990). 8. Obverse and reverse of 'Temple' type silver denier of unidentified mint in name of Emperor Louis the Pious, PG.112, Grierson Collection, copyright the Fitzwilliam Museum, Cambridge. §15. This resort to lettering was of course not unusual: in fact, claims of authority made in writing are much more common, and accessible, at least to the literate,3 on medieval coins than this sort of statement-through-imagery. We know, for example, from sources such as the Anglo-Saxon Chronicle, that King Æthelstan of Wessex (924–39) strove to place himself in control, at least as overlord, of the whole island of Britain (Hare 2004; two new biographies of Æthelstan are in production by Sarah Foot and Charles Insley.) 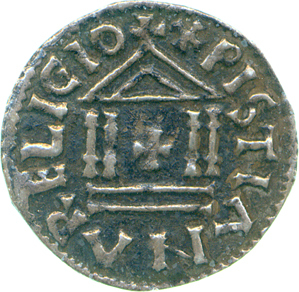 It is one thing to see this ambition in the parchment record and another entirely to find that he was, by means of the coinages he ordered minted, transmitting such a claim through the island's exchange network in the form of silver pennies bearing the legend ÆÐELSTAN REX TOT BRIT (here rather abbreviated), for Æthelstan Rex Totius Britanniae, 'King of All Britain'. The Chronicle's picture might be distorted by knowledge of later events, or by the pro-Wessex agenda which its texts are so often alleged to have had (Scharer 1996); the coinage is a contemporary statement in the name of the ruler himself, and while the king's control over the precision of design might be questionable, Æthelstan's laws on the coinage and its standard show that he was well aware of coins that were issued in his name and the standard that his reputation demanded they keep; if the design had displeased him, it would have been replaced (Attenborough 1922, 126–43 for the laws; see Screen 2007, and, more generally on kings and law, Wormald 1977). 9. Obverse of a silver penny of King Æthelstan of Wessex struck at Winchester by the moneyer Otic between 927 and 939, North type 675, SCBI 1 580, CM.1.57-1930, from the Frank Smart Collection, copyright the Fitzwilliam Museum, Cambridge. §17. There are therefore a wide range of ways in which a coin can be used as historical evidence, and still more ways open up when many coins are available. A coin is an artefact and also, often, a text, and some exist in quantities that make statistical conclusions possible. But it should not be forgotten either that these tiny discs are very often very high-quality specimens of metalwork and of the art of the engraver, being in their detail genuine artworks of their period, desirable and collectible for that reason alone to many people. §18. There are a great many private collections of coins, often assembled for such artistic reasons as much as or more than reasons of antiquarian interests, although many have been assembled for the purposes of study. Private collections are, however, rarely available for such purposes, and the student of numismatics will usually find himself dealing with coins in museums. This presents a number of issues. Firstly, a museum's coins may be on display, in which case it is unusual to be able, for example, to see both sides of a piece. In the second place, a museum's collection usually focuses on particular sorts of coinage, local ones in the case of local museums, or a representative selection if a larger establishment. Only rarely will a museum have deliberately chosen to acquire many coins of the same type such as might be useful for concerted die-study or similar work. §20. 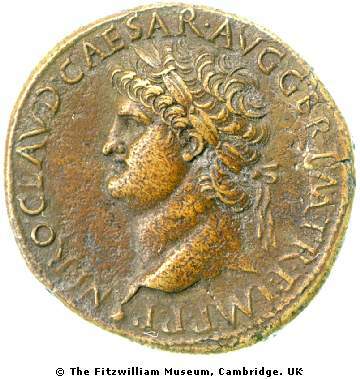 It is perhaps natural that the present writer thinks highly of his place of employment, but the Fitzwilliam Museum in Cambridge is considered a leader in the field of digitisation and dissemination of its medieval coin holdings. In addition to this, because the Museum has acquired a great deal of its material in the form of large and indivisible collections, it is often closer to having a study group of coins of particular types than are deliberate selective collections. 8. Professor Philip Grierson in front of the medieval coin cabinets in the Grierson Room, Department of Coins & Medals, Fitzwilliam Museum, 2005; copyright the Fitzwilliam Museum, Cambridge. §21 The Museum's holdings of medieval coins are especially strong, and this is due in large part to the collecting efforts, both for himself and for the Department of which he was Honorary Keeper for fifty-seven years, of Professor Philip Grierson, who died early in 2006. Much has been written of Professor Grierson's life and work and this is not the place to duplicate it. His collection, which was bequeathed to the Museum at his death, is now largely stored in the room in the Department for whose construction he paid and that bears his name, where he is shown in the picture above. Professor Grierson's more than 20,000 coins form the great bulk of the Department's medieval holdings, and a great many more were acquired with funds that he made available to the Museum, but other collections of note enhance the available material, most notably the William Conte Collection of Anglo-Saxon and Norman coins and the recently-acquired De Wit collection of Anglo-Saxon pennies, which go to complement Professor Grierson's principally Continental interests. The Michael Broome Collection of Islamic coins, also a recent acquisition, contains an important body of medieval material, and the Department's substantial Indian holdings add further breadth to our definition of the Middle Ages. In total we can probably count close to thirty thousand coins of the Middle Ages, of which nearly three-quarters are European. §22. The coin collections at the Fitzwilliam go back to the eighteenth century, when a collection was formed in the University Library (Pollard 1979; Graham Pollard sadly died during the drafting of this paper.) The core was the 1744 bequest by James Gale of his collection, but registers and catalogues preserved at the Fitzwilliam show that acquisitions followed from a wide range of donations and purchases by various interested parties. When the Fitzwilliam was opened in 1848, moves were made to transfer the coin collections there where they could be better used, and this transfer was performed in 1855, although the Museum had already made some acquisitions of its own in the interval. Further large additions were made in the 1920s and 1930s, when not only did several substantial bequests from collectors arrive with the Department, but several other collections from the Colleges of the University were deposited with the Museum on loan for their better care and more advantageous use. The most substantial of these were the collections of Trinity and St John's Colleges, loaned in 1937 and 1938 respectively, but various others arrived at similar times and remain in the Department to this day. §23. Over the two decades between 1920 and 1940, in fact, it is probable that over ten thousand coins arrived in the Museum. The staff of the Department at this time comprised two men, a Keeper and an Assistant, and the Keeper's post was an honorarium held by a scholar with responsibilities elsewhere in the University, one notable example being Montague Rhodes James, more famous for his ghost stories than his care of the University's coin collections. The upshot of this was that the work of adequately cataloguing this vast influx of material was beyond the manpower available. The tidy writing of the various staff members fills pages of the Department's accession registers and sheets and sheets of lists of the collections, but details are few and often insufficient in themselves to identify the coin in question. In addition, the registers began to be kept only in 1908, so that of anything acquired before that date can be found a provenance only if it is in one of the older manuscript catalogues, which do not cover the full collection at any point, or if by good fortune a ticket has been kept with the coin that explains its arrival in the Museum. Despite such gaps and blanks, there is a great deal that can be done and this process of identification, cataloguing, description and attaching to provenances is the bulk of the work that falls to the present writer in the Museum. §24. In the current day and age the accessibility of all museums' collections is among the establishments' foremost concerns, not least because various sorts of public funding are naturally contingent on such public benefit. In the past, aside from welcoming visitors, the Museum's main method of providing this accessibility was by printing catalogues of its collection, and these still continue as major pieces of research publication, involving high-quality images and as up-to-date information as can be provided in a medium that can take a year to produce once the content is finalised. For the readers of The Heroic Age, the most important of these will be the various volumes of Professor Grierson's Medieval European Coinage project, whose first volume was published in 1986 (Grierson and Blackburn 1986). Now, under the direction of Dr Mark Blackburn, the Keeper of Coins and Medals, it is expected to put forth volumes on the Iberian Peninsula and Northern and Central Italy shortly. These volumes, as well as being definitive histories of money in the areas and periods concerned, give a full catalogue of the Fitzwilliam's holdings and will be the principal record of Professor Grierson's collecting work. The Museum's other medieval publication effort is in the coordination of the Sylloge of Coins of the British Isles, a British Academy project that aims to list all British coins of the period 350–1180 in public collections, of which 55 volumes are already published and more in progress. §25. All the same, print publication is a slow business, even where existing Museum collection records can be made to serve the process, and far greater accessibility is available from publication online. Because the Museum's collections need cataloguing and documentation for a whole range of reasons, this process can be made to serve the production of an online catalogue with little ongoing technical difficulty. Such online cataloguing is the bulk of the Museum's electronic outreach, with records for 38,451 coins currently online, of which 4,454 are medieval European pieces. All the catalogue records have thumbnail images and links to large images, and as much information as can usefully be presented from the database in which our catalogue records are stored. 9. OPAC catalogue record for CM.YG.1139-R, a silver penny of King Alfred bearing the London monogram, from London, between 886 and 899, copyright the Fitzwilliam Museum, Cambridge. 10. The search screen of the Early Medieval Corpus database of the Fitzwilliam Museum's Department of Coins & Medals. §27. Two warnings must be made to numismatists and scholars using EMC as part of their evidence, however. Firstly, findspots are only recorded to parish level, for confidentiality reasons; this will tend to locate a find at the parish church on the map, whereas it may have come from anywhere nearby. 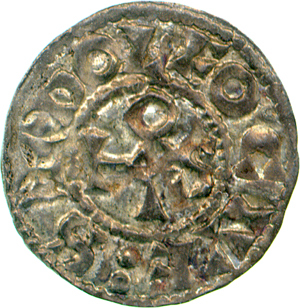 Secondly, although our list of types has been extensively altered since its inception, its basis is the well-known work, English Hammered Coinage by Jeffrey North, and its regnal dates and divisions date largely from that work, not from more up-to-date research, which would require us to extensively overhaul a functional system and make choices which would not be completely agreed in the scholarly world (North 1994). By sticking with North's divisions we can at least hope to be anachronistic only in a well-known and checkable direction. In the past, however, the present writer has had to disillusion students who believed EMC to incorporate, for example, the latest scholarship on the regnal dates of kings of early Northumbria, and it is my hope that this warning may in some way decrease the possibility of others falling foul of such a misapprehension. §28. For the final part of this article, I give some brief idea of the processes employed for the cataloguing and display of the Museum's coins, and suggest what developments can be expected in the future. §29. The actual work of getting coins into the database is dictated from the start by the structure of that database. Atomization of data is key at this level; one field saying that a coin is a penny made at Watchet in 1042 is much less flexible and searchable than one each for its denomination, mint and date. In fact, items are recorded with a date range, to permit uncertainty, but the principle is the same. This atomization goes down as far as separating numbers in measurements from their units, and numbers must be given in the correct formats. For example, for our database BCE dates must be recorded as minus numbers, otherwise the system will know no better, and coins from pre-Common Era will be given backwards date ranges that automatically exclude such an impossible period from searches by date! And similar issues arise elsewhere. One has therefore when cataloguing to think very carefully about what the processes through which this data will be put will do to one's information, and prevent oneself from assuming knowledge at any point. 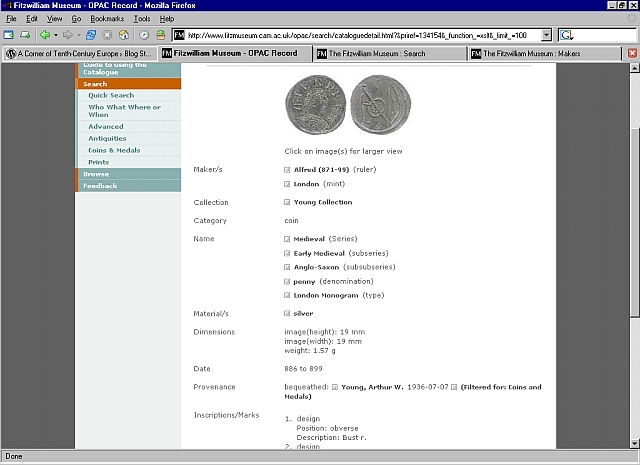 The data for the databases is recorded in a carefully formatted spreadsheet, therefore, and, once complete and checked against the existing records to ensure that all common names are being given in such a way as to link up (because the database is not aware, for example, that "Augustus (BC 14–27 AD)" is the same as "Augustus (14 BC–27 AD)" unless it has been told so), this writer's task ends and it is down to the Museum's computer technician to heroically script the import of this new data into our ADLiB database, a process which we have now more or less automated but which is never entirely trouble-free. At the same time, the images are imported, which leads one to the question of how our images are made. 11. 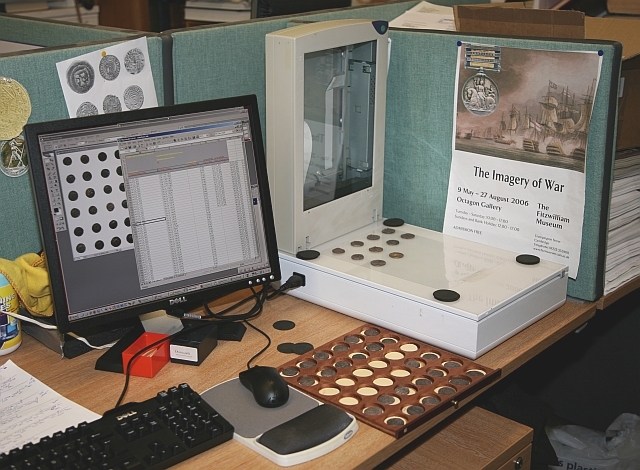 The Documentation workstation in the Department of Coins & Medals, Fitzwilliam Museum; copyright the Fitzwilliam Museum, Cambridge. §30. In Coins & Medals, unlike some other parts of the Museum, we have the advantage that our objects are basically flat. This allows us to make our images with a standard flatbed scanner, which vastly simplifies the imaging process because of giving us life-size images with immediate control over resolution and exposure. Images made with a camera must, by contrast, be scaled by some outside reference which then has to be removed from the image, or else left in, to guide the viewer. The scanner avoids this difficulty, but our scanner is not used in the standard way. Coins are laid out on a lightbox, in steady rows of four; we usually aim to scan twenty-four coins at once. The scanner, which has been customised to run upside-down, is then lowered over the coins, being kept out of contact by plastizote discs at its corners. Because the focus point of a scanner is at its screen, however, the separation between glass and objects must be kept to the minimum possible. The lightbox is illuminated, which effectively 'burns out' the background of the coins, which thus appear on a bright white field with no variation. The scanner is then played over the coins, and where necessary multiple 'takes' are made, to allow for the variation of exposure necessary to successfully capture good images of coins in a variety of metals and conditions. In general, it is better to under-expose than over-expose, because over-exposure causes areas of 'white-out' which are genuine loss of data, whereas under-exposure or dimness can frequently be remedied in processing. Gold must be taken very dimly to avoid reflection and glare; bronze will soak up much more light, but its corrosion is frequently mildly fluorescent, which can result in quite surprising coloration of corroded coins when subjected to a scanner bulb. The different images made necessary by such factors are laid over each other using Adobe Photoshop, and then saved as full-page scans. §31. The next step is to mathematically divide up these scans, which because of the steady grid used for laying out the coins leaves us with, as it usually is, twenty-four images each with a coin roughly in the centre. This process is carried out using Atalasoft Eyebatch, which is also used to crop the surplus white-space whose uniformity and clear differentiation has been ensured by the use of the lightbox. Finally, individual images are opened in Photoshop for enhancement of contrast, adjustments to orientation and so on. These processes can be largely scripted, especially with large numbers of similar coins, and the writer is always refining these techniques. The end result is a full directory of images which are renamed to match the new object records using scripting techniques designed by Museum Computer Manager Shaun Osborne, and these are imported and the reduced-standard versions prepared that are made available on the web. If cataloguing and imaging are proceeding simultaneously, and the coins are not too obscure, a hard day's work will see four scanner-loads, that is 96 coins, scanned both obverse and reverse, added to the prospective import. §32. The main improvement that can be made to the digital access to the Department's collections at this time is to redesign the search form we currently use to allow for the new breadth of the digitised collection. The form was originally designed when the collection was largely composed of royal coinages of one sort or another, and very poorly serves those who are looking, for example, for the unofficial trade tokens of the seventeenth century, of which the Museum's collection is extraordinarily rich. This work is in hand in-house, but we can also expect much larger innovations from outside. The work of cataloguing may be dramatically cut by the results of a project to which the Museum is contributing to develop automated software tools for the recognition and identification of coins based solely on digital images.6 The aim of the project, which goes by the name Combat Online Illegal Numismatic Sales, or COINS, is in fact to enable the police forces of Europe to more effectively chase stolen coins put up for sale on the Internet, but the tools that this requires will clearly have great application in other areas of numismatics, especially perhaps in the digitisation of collections held in museums with no in-house expertise in coins. The project is also developing routines for standardizing and sharing such information that may make access to such data possible as part of larger corpora, thus increasing its comparison value. 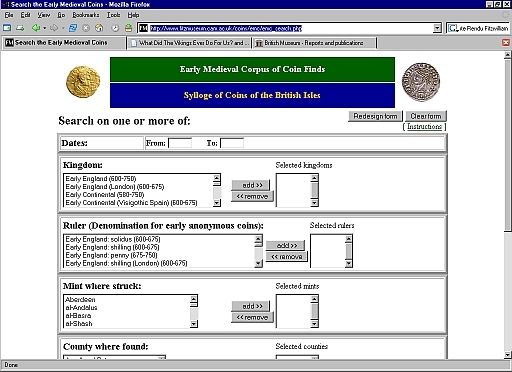 One other thing that may help users find and study our coins is greater incorporation of search terms intended to describe the iconography of our coins, using a standard scheme such as CIDOC C. R. M.; this is currently under consideration for the Museum as a whole. 1. I owe the story that goes with that phrase to my learned colleague Professor Ted Buttrey, who reported to me having once been asked whether coins ever lied by someone to whom he was talking. He got them to find a British pound coin, weight some 9·5 g, and look at the reverse, where the legend "ONE POUND" is to be seen, and said, "What do you think?" 2. Controversy over the traditional interpretation of the Vikings as bloodthirsty raiders that had been drawn straight from the contemporary sources was first raised in Sawyer 1962. Sawyer's work has led to a body of study that deepens our understanding of Viking as an economic activity, but the impression left by the Christian sources and the later sagas of the Northmen as rejoicers in bloodshed is hard to completely disperse. Recent research is presented in Sawyer 1997, but the range of interpretations remains wide: compare Nelson 2003, Jones 2006 and Blackburn 2005. The debate will doubtless continue for some time yet. 3. The extent and depth of literacy in early medieval Europe is an extremely vexed question. The case for extensive lay literacy such as the propaganda purpose of such coins would require is put by the various scholars gathered in McKitterick 1990, but agreement has not been universal. 4. An example of such technology at work can be found on the homepage of the company Arius 3D, where a manipulable 3D image of a fourteenth-century thaler is available to play with: http://www.arius3d.com/main.html?contentId=7, last modified February 3, 2009 as of February 23, 2009. 5. One of the principal omissions, sadly, is the acquisitions of the British Museum, which is the destination of many of the coin hoards found in Britain. Two volumes of the Sylloge were published from the collections at the BM, but they cover only the Hiberno-Norse coinage and the Anglo-Saxon coins from the years 924–959 (Dolley 1966 and Archibald and Blunt 1986). This leaves a very great deal to be published. SCBI volumes are in preparation to cover the early gold and silver coins (c. 600–750), the Expanding Cross and Pointed Helmet types of Edward the Confessor, the coins of Henry I and the Short Cross sterlings, but as yet no dates have been set for these publications: see for more information http://www.fitzmuseum.cam.ac.uk/dept/coins/projects/scbi/future.html (accessed February 23, 2009), and obviously much more remains between these volumes. Some of it is available, though not in the EMC or SCBI databases, in the nineteenth-century catalogues of the BM's Anglo-Saxon holdings, Keary 1887–93. 6. For those that may be interested in such things, the leader of the Austrian contributors to the project, Dr Martin Kampel, has a list of related publications up on his webpages at http://www.prip.tuwien.ac.at/people/kampel/publications (accessed February 23, 2009). 7. The present writer must thank Dr Mark Blackburn for his help and suggestions with this paper and his willingness to allow the Department's work to be explained thus to The Heroic Age. I must also thank Dr Martin Allen and Rory Naismith for help and advice. Apologies are also offered to any who have suffered from me explaining the material here in person. What flaws remain after the various inputs and suggestions mentioned are of course my own.